I'll be the first to admit that Acadia National Park doesn't exactly fit the description of a "Day Trip" from York Maine. But we go to the Acadia/Bar Harbor area at least once a year from York, and I can tell you that it's an easy two day trip! At well over 100 miles from York, it usually takes us 4+ hours to reach Acadia National Park, depending on how long we stop for lunch. But what a beautiful ride! 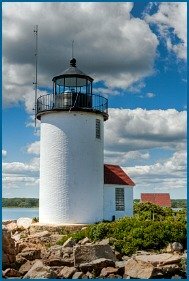 We take the coastal route, which brings us right through the gorgeous Maine towns of Camden and Rockport, among others. In short, even though it's far, I'd feel like I was letting you down if I didn't tell you that you can take a weekend and see Acadia National Park while you're here in southern Maine. If you'd like to stay overnight for the weekend, browse through over 500 incredible Bar Harbor vacation rentals and Mt. Desert Island vacation rentals and see which one you like best! Acadia National Park is located in "Downeast" Maine. Most of the park is on Mount Desert (prounounced "Mount Dessert") Island, which is accessible by car. People have always been attracted to the majestic, rocky coast of Maine. In the early 20th-century, wealthy island residents donated the land that eventually became Acadia National Park. This American national park is home to a wide range of plants and animals, and to the tallest mountain on the U.S. Atlantic coast. Visitors hike miles of beautiful trails up the granite mountains, bike the historic carriage roads, or just relax and enjoy the scenery. Acadia was the first American national park east of the Mississippi river, and it remains the only national park in New England. Cadillac Mountain in Acadia is the highest mountain on the American eastern seaboard, and at certain times of the year is the first point in the United States to see the new dawn. The 20-mile Park Loop Road is quite likely one of the most awe-inspiring drives in North America. Don't skip the 3.5-mile road up Cadillac Mountain or a stop at Thunder Hole at high tide! Driving the entire road, including short stops to read wayside exhibits or enjoy the scenery, takes three to four hours. During the summer months, especially July and August, the Park Loop Road and parking lots along the Park Loop Road and at carriage road entrances can be quite crowded. Parking is permitted only in designated (posted) areas, parking lots, and established roadside pullouts. To avoid the crowds and parking issues, you can ride the free Island Explorer buses to many park destinations. We are usually on Mt. Desert Island in September or October, and have never found crowds to be an issue during that time of year. Acadia is a hiker's paradise. Within the park, 125 miles of trails offer choices for all ages and abilities. From flat walks across fields to super challenging climbs up iron rungs, you can find it here. Terrain varies from rugged shoreline and deep woods to open mountain summits with views of the ocean and islands. For those who prefer more level footing, there are approximately 45 miles of wonderful carriage paths. Leashed pets are permitted on most trails. Forty-five miles of rustic carriage roads weave around the mountains and valleys of Acadia National Park. Most of those roads are still available for horseback travel either on a carriage ride with the park concessioner at Wildwood Stables or on a horse of your own. Parking for your horse trailer is available at Wildwood Stables. I strongly recommend the Wildwood Stables horse and carriage tour. We took the tour after having popovers at the famous Jordan Pond House, and it was sheer magic to be snuggled under a blanket in the fall, drawn by horses up the stone roads, learning from our guide how those roads were built and coming to a better understanding of what a national treasure Acadia National Park really is. For complete information about visiting the park, please visit the official Acadia National Park web site. Bar Harbor Maine is arguably the most well-known Downeast town, and for good reason. It's wicked fun and SO beautiful! Though there are many beautiful towns along the shores of Mt. Desert Island, we almost always stay in Bar Harbor. There are too many great restaurants, activities and shops to stay away. From Bar Harbor, it's very easy to tour the entire island by car or bicycle, including driving along the only natural fjord in North America, Somes Sound. A few years back I decided I wanted to cross the finish line of a marathon at least once in my life. Having no desire to train to run a marathon, I decided to train to walk a marathon. 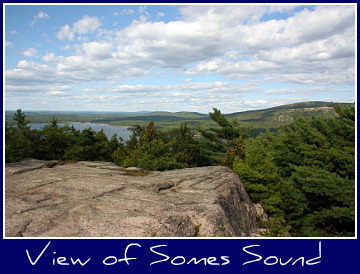 Why, one of the most scenic marathons in the entire country - the mid-October Mount Desert Island marathon. It took me seven hours to walk those 26.2 miles from Bar Harbor to Southwest Harbor, including up one side and down the other of Somes Sound, but what a way to really see the island! If 26.2 miles sounds like a bit much, my husband usually runs the Bar Harbor half marathon held in mid-September: 9 of those 13.1 miles are on the car-free carriage paths of the park and he says it's a runner's heaven. Running in Bar Harbor reminds me of my friend Tom. Tom and I grew up together, and Tom moved on from running on the high school cross country team to being a mover and a shaker in the Bar Harbor running scene. Tom also happens to own one of the best year-round Bar Harbor restaurants - Jack Russells Steak House & Brewery. We always have a great time and a superb meal at Jack Russells, particularly when we're in the mood for steak!